On 17 December 1903 the Wright brothers made the first powered, long and controlled airplane flight at Kitty Hawk, USA. Wilbur Wright was born in 1867 on a farm near New Castle, Indiana; Orville was born in 1871 in Dayton, Ohio. The Wright brothers began as bicycle-makers but became keen on flying after hearing about the death of pioneer glider Otto Lilienthal in 1896. From 1899 to 1903 they worked at Kitty Hawk methodically improving their design and flying skill. Many early planes took off but lacked control. The key to the Wrights’ success was stopping the plane rolling, using wires to ‘warp’ (twist) the wings to lift one side or the other. The Flyer’s wing warp meant it could not only fly level but make balanced, banked turns (like a bicycle cornering). For the first flight Orville was at the controls. The historic first flight lasted 12 seconds, in which the Flyer traveled 37 m and landed safely. Wilbur Wright, and his brother Orville, flew into both history books and legend with the first ever manned powered flight.The historic flight was the fruit of their unending devotion to the pursuit of their goals. Although this was his most notable accomplishment, Wilbur led a life full of many achievements and triumphs over adversity. 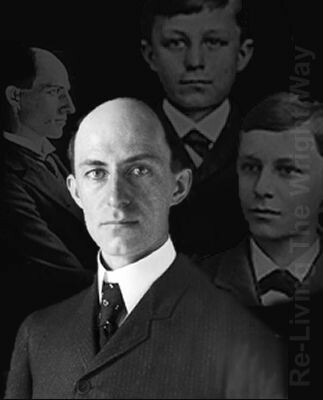 Wilbur Wright was born on April 16, 1867 in Millville, Indiana. He was the third child of Bishop Milton Wright and Susan Catharine Wright. The family moved to Hawthorn Street in Dayton, Ohio. Wilbur, a strong-willed individual, was able to repeatedly bounce back from physical and academic setbacks. As he entered adulthood, he teamed with his brother Orville to develop new and unusual schemes. 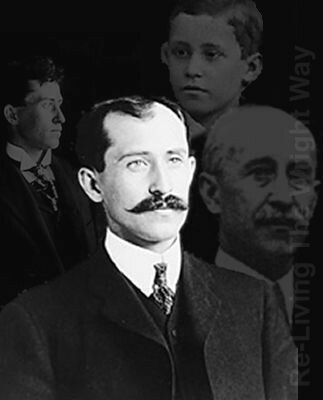 Orville Wright was born on ,august 19 1871 on 7 Hawthorn Street in Dayton, Ohio. He was the fourth child of Bishop Milton Wright and Susan Catharine Wright.Orville grew up in an atmosphere that was loving, and that nurtured all types of expression. Orville wrote of his childhood: "We were lucky enough to grow up in an environment where there was always much encouragement to children to pursue intellectual interests; to investigate whatever aroused curiosity." The two libraries in the Wright house were especially encouraging of academic pursuitsOrville was the more mischievous of the two brothers, had a healthy childhood, and wasn't inclined to excessive study. He was also "a champion bicyclist and so the brothers went into the bicycle business, which gave full vent to their mechanical aptitude.